A unique habitat, shaped by man over centuries. A living natural landscape. Learn all about it at the Maison du Marais. A small corner of nature. A place of land and water. Shaped by human hands over thirteen centuries. The figures are impressive: 13,000 cultivated plots, 700 km of canals, 5,000 owners, almost a third of France’s aquatic fauna. But it is also the last marshland market garden. There are families that live and farm here. An exceptional landscape, unsurprisingly listed as a UNESCO world heritage site. Before exploring this unique territory, listen to it breathe at the Maison du Marais. 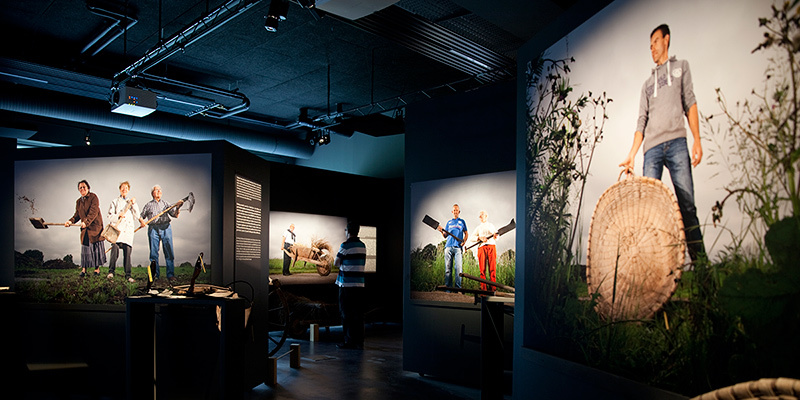 Opened in 2014, it vividly narrates the history, habitat, and biodiversity of the Audomarois marshes. You’ll be guided through with words, models, films and even aquariums, telling you everything you need to explore the marshes. Numerous routes for exploring on foot or by boat begin at the house. Climb into a bacôve (flat-bottomed boat) and explore more deeply this unique territory, crafted by time and human hands. In these marshes, there are things to see, but also to eat. Don’t forget to shop for vegetables and flowers before you leave.